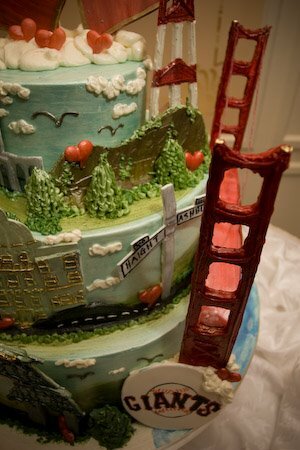 I've done New York City and Los Angeles themed cakes more than I can count, but until this weekend, I had never been asked to make a San Francisco cityscape. Of course, now that I live here again, I was so excited to finally take on this challenge. Although I couldn't include every landmark, and now that the cake is done, I keep running into buildings I could have made, but I think it came out pretty cool. My fabulous friend Natalie Wi of Allure West Studios met me at the Marine' Memorial Club downtown on Sutter and Mason to take some great shots. The Marines' Memorial is really a beautiful venue with two gorgeous ballrooms-definitely worth checking out for your wedding.